ENGLAND WING MARLAND Yarde has signed a three-year contract with Sale Sharks after a potentially ‘poisonous’ fall-out with Harlequins. 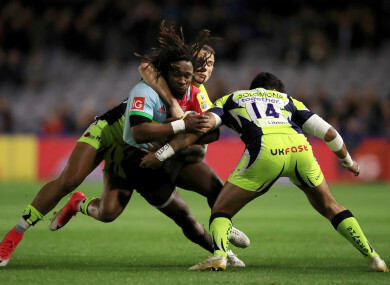 Yarde was contracted with ‘Quins until the end of this season, but amid reports that he missed three training sessions – the latest of which was the captain’s run before the Champions Cup defeat to Wasps. ‘Yarde was told he needs to get out before it becomes a bit poisonous,” an unnamed source told the Daily Mail this week. In a statement released this morning, Harlequins director of rugby John Kingston said it was in the best interest of the club to allow the 25-year-old, 13- cap international to leave. Harlequins currently occupy fifth in the Premiership and will face Ulster in back-to-back Champions Cup clashes in December. Third from bottom with two wins and 14 points, Sale Sharks director of rugby Steve Diamond will hope the addition of Yarde can spark his side to rise in among the race for play-off spots. “Marland is a very exciting player and he will very much suit our attacking style of play,” says Diamond. Email “England wing Yarde signs with Sale after Harlequins fall-out”. Feedback on “England wing Yarde signs with Sale after Harlequins fall-out”.